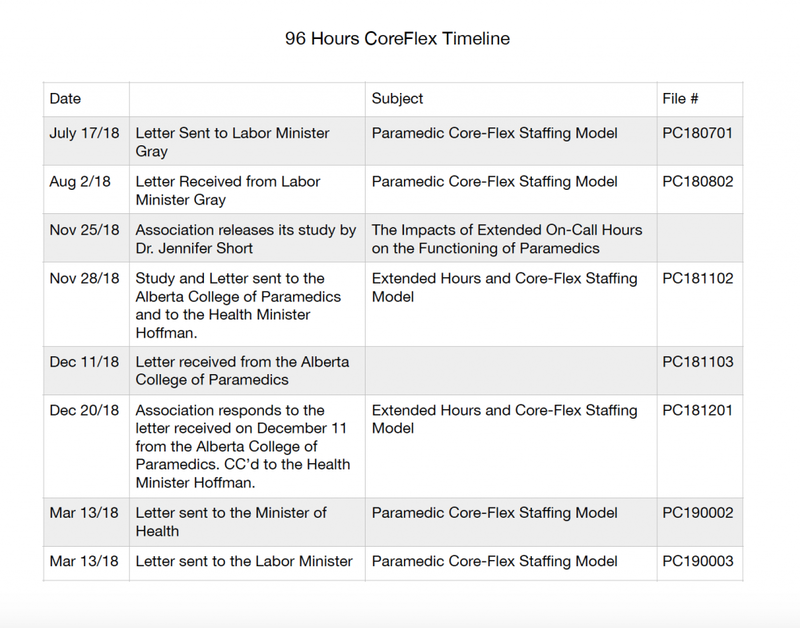 The Association has been engaged in an extensive professional fatigue impact study with a focus on both the psychological and associated health effects that a Core-Flex staffing model has on Alberta’s paramedics. The Core-Flex model schedules EMS practitioners to provide emergency health services for an extended period of time which is typically 96 hours or more in duration. Within Alberta, there are approximately 190 ambulances, providing front line emergency response, utilizing this staffing model. Within our study, the Association has identified the following three major areas of concern within the Core-Flex model that identifies this practice as an immediate risk to public safety with a high potential to compromise patient care. In an effort to reduce the liability of fatigue, EMS operations have started to implement fatigue management policies. These management policies are based on a “time on task” formula; which focuses on items such as emergency calls and inter-facility transfers. These policies fail to consider the total time a paramedic is awake within its “time on task” calculation. The result is that paramedics are awake for an extended period of time prior to being assigned a task that can be calculated towards their “time on task” clock. Due to this, practitioners have reported being awake for greater than twenty-four hours but haven’t accumulated enough hours to go out of service for fatigue. Additionally, practitioners have reported micro sleep during patient care or while driving the ambulance. When the criteria are met within current fatigue management policies, ambulances within our communities are then “out of service” for set periods of time requiring ambulances to respond great distances from other communities who may also be subject to the Core-Flex model. To circumvent the impact that fatigue management policies have on our EMS coverage, fatigue management policies have incorporated a strategy where paramedics who are high on “time on task” hours are being reserved for critical patients and emergency calls. In essence, this results in the requirement of fatigued paramedics to provide care to patients (people of Alberta) who require the highest level of critical thinking and medical interventions. There is no consideration within the Core-Flex model and the fatigue management policies for paramedics to properly prepare for each shift; determine regular work hours; establish a regular sleep cycle; or address sleep fragmentation and sleep deprivation. “Sleep inertia refers to a period of impaired performance and reduced vigilance following awakening from a regular sleep episode”. The practice of Core-Flex exposes the public, patients, and practitioners to increased risk of accidents, injuries, and medical errors. Sleep Inertia is strongly connected to the Core-Flex model which is more prevalent in the rural sector. The rural paramedics are more likely to coordinate emergency situations with less available resources, respond greater distances for emergencies and inter-facility transfers while in a state of impaired performance from sleep inertia. This can result in increases in occupational injury, vehicle accidents, and risk of medical errors. The Association consulted with Psychologist and researcher Dr. Jennifer Short to examine the psychological impacts of a Core-Flex model. In her report prepared for the Association, The Impacts of Extended On-Call Hours on the Functioning of Paramedics, it was identified that paramedics experience sleep deprivation or sleep fragmentation, even when they’ve had the opportunity to rest during the shift. Furthermore, it also stated that these sleep disturbances have been extensively linked to disturbances in cognitive functioning, which will consequently impact both the effectiveness of paramedics and public safety. See below for the corresponding letters to the timeline on the left. This will help keep the letters and correspondence in perspective as well as in chronological order.